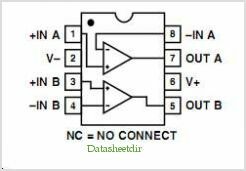 The OP221 is a monolithic dual Operational Amplifier that CAN be used either in single or dual supply operation. The wide supply voltage range, wide input voltage range, and low supply current drain of the OP221 make it well-suited for operation from batteries or unregulated power supplies. The excellent specifications of the individual Amplifiers combined with the tight matching and temperature tracking between channels provide high performance in Instrumentation Amplifier designs. The individual Amplifiers feature very low input offset voltage, low offset voltage drift, low noise voltage, and low bias current. They are fully compensated and protected. Matching between channels is provided on all critical parameters including input offset voltage, tracking of offset voltage vs. tem- perature, non-inverting bias currents, and common-mode rejection. By Analog Devices, Inc. This is one package pinout of OP221,If you need more pinouts please download OP221's pdf datasheet. OP221 circuits will be updated soon..., now you can download the pdf datasheet to check the circuits!